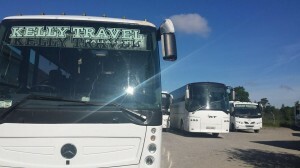 We offer the highest quality in executive coach hire available in Ireland today. Facilities such as Free Wifi, air conditioning, comfortable reclining seats, tv/video, tables and fridge are available on many of our private hire coaches. Fully qualified, experienced & reliable drivers. All vehicles subject to independent safety checks every 4 weeks. All vehicles go through a safety check prior to departure each morning. All vehicles hand cleaned, inside and out, every day. Fully compliant, clean, safe vehicles. Tax compliant, NERA compliant, RSA compliant, NTA compliant, Working Time Directive compliant. Whether you are going to an event 5 miles or 500 miles away, just give us a call, we are always happy to help. Kelly Travel Provide Private Hire, Private Bus Hire & Coach Hire Ireland nationwide, and service cities such as Dublin, Limerick, Cork, Galway & Waterford.